The Gloster Gladiator was a British-built biplane fighter developed from the Gauntlet and its prototype, designated SS.37, flew in September 1934. The first production model was the Mk.I, which became operational in January 1937. An improved Mk.II version followed in 1938 and eventually 270 aircraft of this Mark were built. A modified Mk II, the Sea Gladiator, was developed for the Royal Navy's Fleet Air Arm. It was fitted with an arrestor hook, a ventral dinghy fairing and other additional equipment for operations aboard aircraft carriers. Sixty production Sea Gladiators were built, with another 38 early Mk.IIs modified as the Sea Gladiator (Interim). The Sea Gladiator was a single-seat biplane of metal construction with mixed fabric and metal covering. It was fitted with a fixed undercarriage, catapult spools and an arrester hook and was powered by a Mercury radial engine turning three-blade metal propeller. Its armament consisted of four guns - two in the fuselage and two under the lower wings. 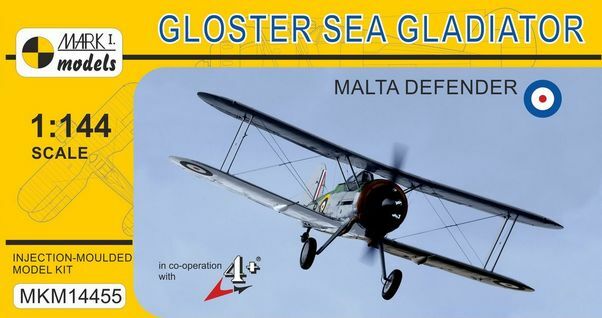 Sea Gladiators served with FAA squadrons from early 1939 and were involved in defence of Norway and of Malta, the latter giving birth of a myth of legendary aircraft to be named as Faith, Hope and Charity.